This is a chronological listing of the bikes I remember to have owned, rebuilt and ridden. It is certainly not complete, and I hope to dig out some more pictures in the near future. the very beginnings! 5/2008: A cousin just sent me this nice, early picture. I think it was taken on a visit to his family, as the machine is definitely not mine. I remember I owned a horrible wooden scooter with tiny hard rubber tyres first, and later a very good FERBEDO one with balloon tyres. ca. 1955 NSU Quickly I just came around the corner when our chimney-sweeper was about to hand it over to the scrap man, this gave me my very first automotive ride at the age of 13.
ca. 1955 Heinkel Perle Moped A very advanced design, having a cast aluminium frame and the rear chain enclosed in an oil bath, but its gearbox was noisier than the exhaust! ca. 1956 NSU Max I was 14 then, and the bike was 1 year older than me. A 250cc ohc engine and a lot of iron for a small boy. We kept it hidden in a friends garden and I remember having a big problem reaching the ground from the saddle! But once I was on the move things were just flying! ca. 1970 Hercules K50 my first real rebuild, 2 bikes into one. With 50cc, 5.3 bhp, 5 speed gearbox and a very effective front brake, it would do 60mph on a slight downward gradient! ca. 1960 Zündapp Combinette Not as fast as the Hercules, but its fan cooled motor would never get tired, and I went all the way down to the French Massiv Central on it. I am not sure if the one in the picture is mine or the one of a friend. Mine started life as a hand change 3-speed, but I found a nice fan-cooled 4-speed engine for it on a scrap yard, which I bought for I think 5 DM at the time. I had to add footrests to the frame, because the 3-speeder had pedals, but there was an extra horsepower and an extra gear, although it wasn't strictly legal.. If you enlarge the picture by clicking on it, you can see us prepared for a camping trip. 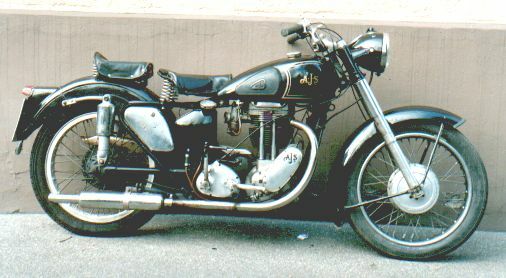 1952 Maico Blizzard 200cc This was my first legal real motorbike, it took me everywhere but it handled like the proverbial greasy pig. 1936 NSU 200cc Pony My first pre-war bike. It was simple and robust with its 200 cc two-stroke engine and unit 4-speed gearbox, but a bit harsh in the transmission department, especially on the overrun. 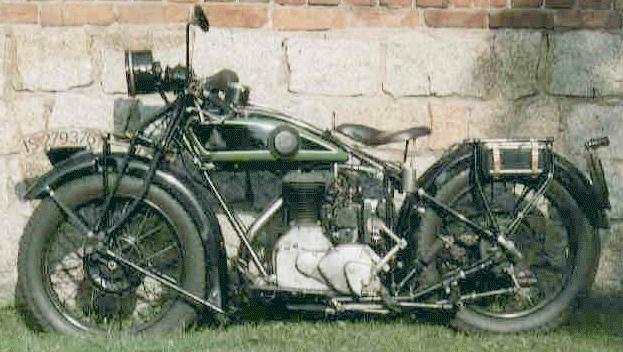 1935 NSU 201S Its little 200cc ohv engine would revv lustfully and would really get you moving. 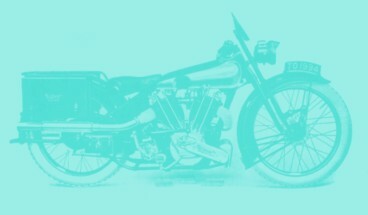 As far as I know it is a design by Walter Moore who came from Norton's to NSU in the 30's and designed the famous 500cc ohc NSU 'Bullus'. NSU & Ariel This bike did not only live in a museum, as the above picture might suggest. My brother has recently found these lovely pictures taken at a Rally near Nürnberg around 1980. He is the happy owner of the 550cc Ariel, incidentally, and doesn't he seem to ejoy it? 1931 FN 350cc Sahara combination I have finally found a few old b&w photographs of this one. It had an incorrect front end and a badly repaired crankcase. I hitched a chair to it and we had some real fun, even in the winter! In the background of the picture, leaned against the fence, there is still my trusty Zündapp Combinette. 1952 NSU 500 cc Konsul On a trip to Great Britain (still as a solo bike at that time), it took me up to John O'Groats, down to Devon and back home. It behaves very well as a combination, too. I've still got it. 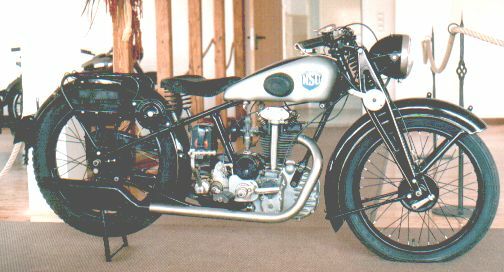 1952 AJS 18S My first British bike; I built it from a few boxes full of pieces. I wrote a lot of letters to England to obtain the missing pieces. I remember Russell Motors sent me a new piston for the princely sum of 8.50 GBP in those days, a set of hi-lift cams was some 14 GBP! I went down to Spain and back on this bike without much trouble, but once broke a timing side main shaft two miles from home. 1928 500cc D-Rad This is the one called the 'Spandauer Springbock', for good, as I found. I restored it from a rusty heap, rode it for about 30 miles and got rid of it very soon. I am afraid the bike on the picture is not mine really, but mine was the same. 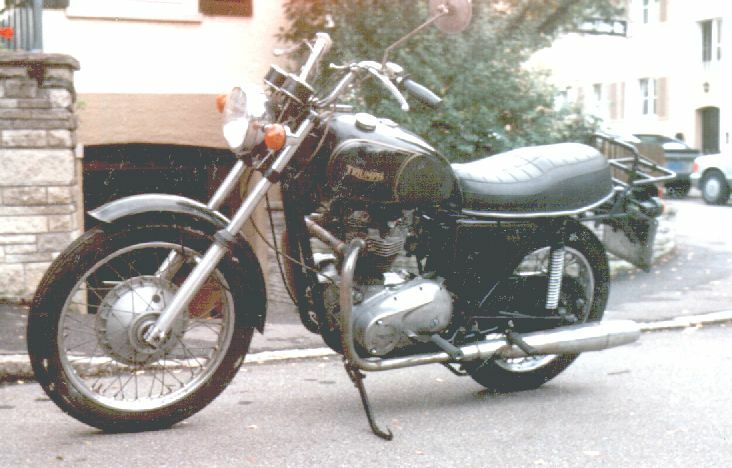 1972 Triumph Tiger TR6R I have done a lot of travels on this one, and it always got me back home. Well, sometimes only just. I remember one time we limped home from France running more or less on one pot, due to a burnt exhaust valve, and another time back from England with blue smoke from the exhaust due to a piston ring which had broken to pieces and found its way out into the exhaust pipe! But I admit having thoroughly abused it, two up plus camping gear. This is the most modern bike I ever owned! 1926 Indian Scout I had started this project when an ex wall of death frame, petrol tank and saddle offered at an auto jumble caught my imagination . I learnt an important lesson during this project: You have to travel quite a lot until you find all the correct bits to build a bike! 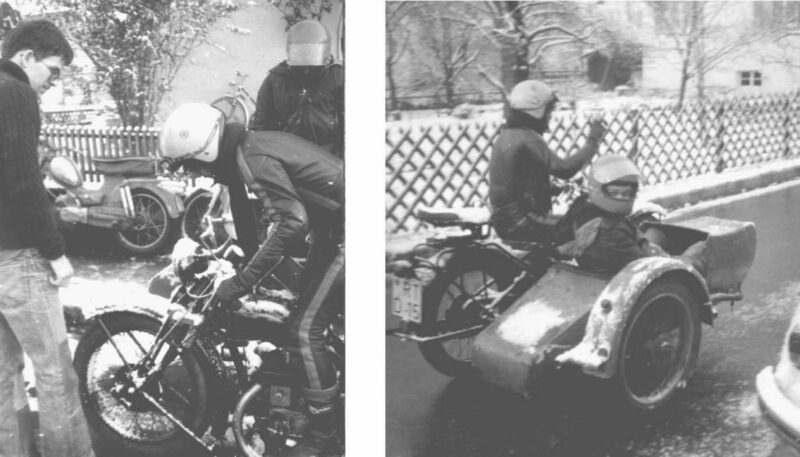 The bike was amazingly lively for a 600cc sidevalve, no doubt this impression was helped by the strangeness of the controls, i.e. foot clutch and left hand throttle!